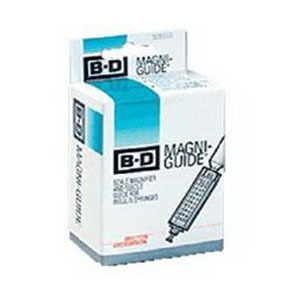 The BD Magni-Guide™ device works as both an insulin syringe scale magnifier and a needle guide. It is designed to offer both dexterity benefits (for those who need help stabilizing the syringe and insulin vial while injecting) and magnification benefits (for those who need help reading the scale on the syringe). Magnification scale of 1-7/10x for easier reading. Convenient to hold and easy-to-use. Works with BD syringe sizes 1mL, 1/2mL and 3/10mL. The insulin vial snaps onto the end of the BD Magni-Guide™ device. A groove in the device allows the needle to be easily guided into the vial stopper.